The revivals of the Great Awakening shook Britain's North American colonies from spiritual slumber during the 1730s, 1740s and 1750s. In Virginia it touched men and women whose spiritual needs had been too long neglected by the legally established Anglican church. In homes, in meetinghouses, and in open fields, rich and poor, black and white, men and women mingled to hear powerful messages of a personal God and salvation. The Great Awakening rattled and cracked the foundations of hierarchical authority and official religion from Georgia to New England, reverberating through the decades to the Revolution and the collapse of British rule. Here is a lesson of faith in freedom. Fullscreen. Produced by Colonial Williamsburg, Gospel of Liberty is a 37 minute, full color, DVD documentary about the American religious revivals of the mid-eighteenth century and appropriate for viewers ages 14 through adult. These "Great Awakenings" roused Britain's North American colonies during the 1730s, 40s, and 50s as they took place in meeting houses and open fields, drawing in the rich and the poor, black and white, men and women with powerful messages of a personal God and Christian salvation. Eventually it was in part these religious revivals that helped to set the political stage for the overthrow of hierarchal authority and state official religions, the American Revolution, and the collapse of British Rule over the colonies. The insights of Thomas Jefferson infuse a dramatic portrayal of colonial Virginia (against the backdrop of Colonial Williamsburg) as a lesson of 'faith in freedom." 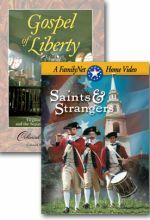 An enthusiastically recommended addition to both school and community library DVD editions, this format enhances Gospel of Liberty with the inclusion of closed captioning and optional English subtitles, chapter titles for easy scene access, a PDF study guide, and two bonus features: "Colonial Clothing 1760-1770" and "Tour Our Town." This is an excellent history of the background of religious freedom that has been a part of our country since the years prior to the American War for Independence and the adoption of our constitution guaranteeing religious freedom. In fact, it is the history of times, specifically in colonial Virginia that inspired such leaders as Thomas Jefferson and others to make sure that the government of this country should guarantee religious freedom for their posterity. This is a well-produced, well-documented look at how all of our taken for granted freedoms of belief came about. I really did learn a lot of religious history I had never know, even though it has been one of my interests and studies for many years. With Thomas Jefferson telling the story, the program recreates the religious Great Awakening of colonial Virginia from the 1730s to the 1750s. It brings to life the fire of George Whitefield, the zeal of Samuel Davies (who later founded and was the first president of Princeton University). Jefferson and others of his time stress the fact that pursuit of the right to worship according to one’s conviction and beliefs, even to the rights of African slaves of the time to be included in God’s kingdom, was an idea that took years to grow and would not have been possible without struggles against a state established church that took place during this pre-United States of America. Rev. Davies stands out as the prime mover of this GOSPEL OF LIBERTY. What a great history video for any congregational library. Recommended for senior high through adults. 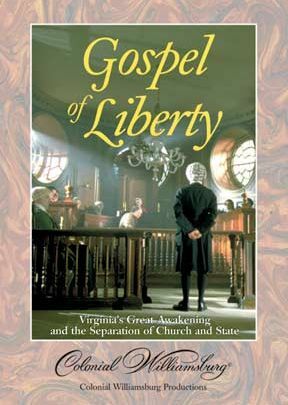 America’s fight for religious freedom did not begin on the battlefield, but in the colony of Virginia in the 1730s, when the Great Awakening, a religious revival movement, swept the land as it spread from Europe. Challenging the state religion as established by England, the Great Awakening’s prominent spokesmen, including Samuel Davies and George Whitefield, preached a concept of a personal God and personal moral responsibility that shook the foundation of the Church of England in the colonies and the social elite that supported its control of religious worship. This important event in the history of our country, and the impetus it gave to the quest for other types of freedom including, ultimately, the desire for political freedom, is well-documented in this dramatic recreation of events set against the backdrop of Colonial Williamsburg. Students should find this approach engaging, and the history buffs will enjoy not just the facts, but also the setting of this treatment of a moment in time that would ultimately inspire the ratification of the First Amendment. Very well done and informative using Colonial Williamsburg as a backdrop helped. Samuel Davies account to pursue religious freedom was very insightful.